Okay, before we had my first impressions post on this product. Now that I've had a few weeks to use it, I can give my full review. I will first say again, that I received these for free for review purposes. 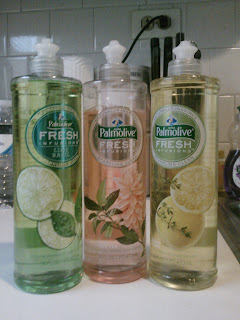 The Palmolive Fresh Infusion soaps are a great new product. They smell good, clean great, and the biggest thing for me in a dish soap - they lather up great! Well, not sure if you'd call it lather, but it makes a lot of bubbles when I soak the dishes, and that's a good thing. My favorite scent is the Ginger White Tea. It's such a unique scent for a dish soap! It's prefume-y and makes my kitchen smell awesome when I'm using it to clean the dishes. I do not have a dishwasher, so I'm always cleaning my dishes by hand! It's also not rough on my hands, which are very dry in the winter time. If anything, it's been keeping them more moisturized cause they don't look as bad! I shared the Lemon Thyme scent and gave it to my grandma - she loved it as well! Check out more at the Palmolive Website and the Influenster Page! You can buy Palmolive Fresh Infusions soaps at Walmart and Target for around $2.99.